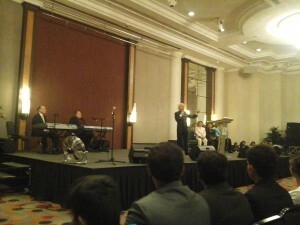 On Tuesday, Abigail, Geenu, and I attended the Benny Hinn meeting at the Orchard Hotel Ballroom. The hall was fully packed. 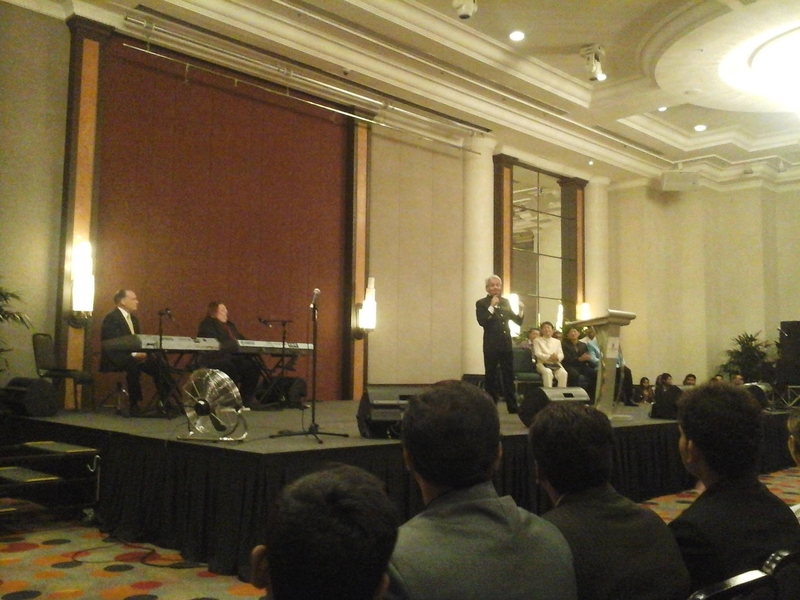 Pastor Benny led the Praise and Worship. The Presence of God was beautiful. People basked in the Glory of God. At first, he shared how to activate the laws of prosperity. Love the Lord with all your heart. Seek first the Kingdom of God. Put Him first in your life. Proverbs 8:21 That I may cause those that love me to inherit substance; and I will fill their treasures. Receive the Word of God from God himself. Job 22:22 22 Receive, I pray thee, the law from his mouth, and lay up his words in thine heart. Obedience. Job 36:11 If they obey and serve him, they shall spend their days in prosperity, and their years in pleasures. Obedience is doing something that activates the harvest. God will help you out of trouble even if trouble comes your way. Then he shared the message on the Holy Spirit. You must understand how important the Holy Spirit is in your life. He is not an influence, He is not a power. He is a Person just as real as God the Father and God the Son. Angels are not a person, they have no capacity to feel emotions. They have the intellect and will but they are not a person. They are spirit beings. But God is a person. You and I are created in His image. God the Father is not God the Son or God the Holy Spirit, God the Son is not God the Father or God the Holy Spirit, and God the Holy Spirit is not God the Father or God the Son. God the Father stands alone. God the Son stands alone. God the Holy Spirit stands alone. Right now, we are in the dispensation of the Holy Spirit. There was a time when God the Father was on earth. He was on the earth during the dispensation of law. God the Father was seen, His voice was heard. People saw the fire of God’s glory. Moses saw Him. God the Father spoke to Abraham, Issac, and Jacob. Even though God the Father spoke, the people of God saw God the Word. Jesus said no one has seen God anytime. What they saw was God the Word, Jesus. When God created Adam, and Adam opened his eyes, he saw God the Son. Prior to becoming flesh, He appeared as an Angel of the Lord, Angel of His Presence. God the Word, became God the Son. Jesus Christ is the Glory of God in flesh. He is the revelation of all that God is. He is the will of God in action. If you want to know what the Father is, look at Jesus. What is the Holy Spirit like? Look at Jesus. Jesus Christ is the full revelation of God the Father, God the Son, and God the Holy Spirit. We are created in the image of Son, Father, and the Holy Spirit. God the Father, God the Son, and God the Holy Spirit are one God, 3 persons. What is Holy Spirit like? He is His Spirit. He is God almighty equal to the Father and Son, in glory, majesty, and power. God the Father has a spirit body. They saw Him and ate with Him. Jesus is the only member in the Godhead with a physical body. Holy Spirit is right now on the earth. Jesus was on the earth. Holy Spirit is the one who dwells in you. Your body is His temple. Your spirit man and the Holy Spirit has become one. There is only one person. You are literally taken over by Him. Jesus is all in all. In Him, you are complete. Jesus in the flesh is not enough. When Jesus walked on the earth, even when they saw Him raise the dead, saw the Glory of God, yet they were not changed. When the Romans hung him on the cross, they forsook Him. Nobody felt the Presence of God when the Holy Spirit was not there, nobody was convicted of sin. Without the Holy Spirit, there is no conviction. Without the Holy Spirit, nobody can change. Jesus in the flesh was limited to one location, limited to healing certain people. Peter, James, and John saw Moses and Elijah talking to Jesus about his death and could not understand it. Without the Holy Spirit, all you hear or see means nothing. Though Jesus was raised from the death and appeared before the disciples, some doubted – Matthew 28:17. How can they doubt even when they saw Jesus Christ? Because without the Holy Spirit, you cannot receive Jesus. You will doubt. Without the Holy Spirit, you cannot love Jesus. Pastor Benny asked the audience, How is Jesus real to you? Have you eaten food with Him or shook His hands? No. He is real to you because of the Holy Spirit. Without the Holy Spirit, you cannot love Him, adore Him. Without the Holy Spirit, Christianity will die in a week. Only the Holy Spirit can make Jesus real. Who is the Holy Spirit? He is Jesus without limitation. Holy Spirit is the Presence of Jesus. Christianity is not a message but a relationship with the Living God. Galatians 5:16 Walk in the Spirit, and ye shall not fulfil the lust of the flesh. It’s the Holy Spirit that sets us free. After the message, Pastor Benny led the people into beautiful worship. The Presence of God was so real and rich. People were healed of their sickness and disease and came forward to testify their healing. It was 10:45 PM when the service ended. Praise God for a wonderful time.